Emotions run high… Get all the talking points from Thailand! Aggressive passes, fighting talk, a brake failure horror story and more top quotes from the Pirelli Thai Round! It was an intriguing encounter in Thailand between Alvaro Bautista and Jonathan Rea (Kawasaki Racing Team WorldSBK). The two WorldSBK stars rarely met on track in Buriram but when they did, it proved explosive. 34-year-old championship leader Alvaro Bautista did not back away from criticising Jonathan Rea’s pass on him at Turn 3 after Race 1 on Saturday, saying: “Aggressive. Very aggressive. You have to ask him if he wanted to do an inside line or make like motocross style block pass – Paah! Bang! There are two points of view,” he said to bikesportnews.com. When watching the video of the clash back after the race, Bautista told worldsbk.com: “In that corner (Turn 3), you go a bit wide. He went inside and goes just to touch me. It is very easy to see.” What is clear to see is that neither is holding back on or off the circuit, making for an exciting Aragon Round. Jonathan Rea has finished second in the opening six races of the WorldSBK championship, the first time since his reign at the Kawasaki Racing Team WorldSBK that he has failed to notch a win up in the first six. Heading for the third round of the championship at MotorLand Aragon, Rea is hoping for his first win of the year. Speaking to Eurosport UK in Parc Ferme, Rea said: “We tested well there (MotorLand Aragon), I felt good on the bike. Every dog has his day – hopefully mine’s in Aragon!” Will Rea bounce back in the Spanish desert to take victory and stop Bautista’s dominance? Eugene Laverty’s bad luck in Buriram continued with a brake failure on the approach to the final corner at the Chang International Circuit, Thailand. The Irishman had a massive accident at the track in 2018, in which he was run over by Jordi Torres. Having yet to better a ninth place finish at the Thai circuit, a shell-shocked Eugene Laverty took to social media to get his emotions across after yet another big shunt in Buriram. One of his strongest weekends in terms of consistency, Alex Lowes made heads turn with his hat-trick of third places. With this, he extended his run of top seven finishes to ten, starting back in Race 2 at Magny-Cours last season. He has finished inside the top five in every race this year, with only Alvaro Bautista, Jonathan Rea and teammate Michael van der Mark able to achieve this alongside Lowes. In an interview with bikesportnews.com, Lowes said: “I felt like I rode a good race to be 15 seconds behind. It is incredible, and that is really disheartening but I have to be positive, and my battle is to try and race with the other Yamaha guys.” It is a battle he is winning with the Yamahas, placing top Yamaha rider in the championship in third, with a 55-point gap between him and Bautista at the top after six races. 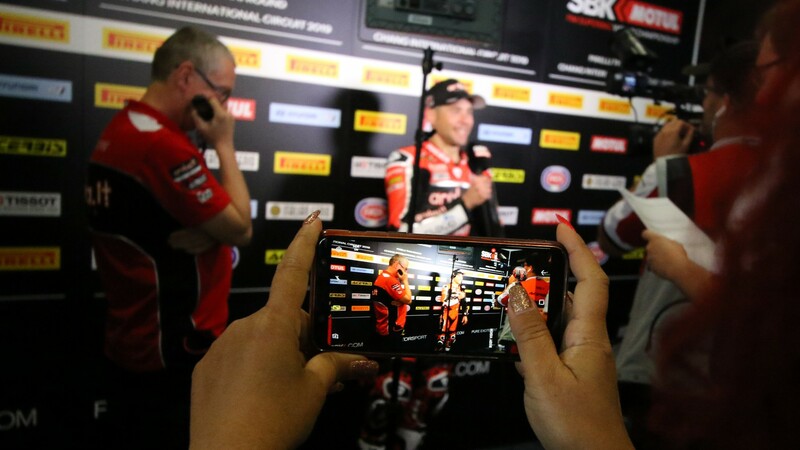 Watch more action through the year with the WorldSBK VideoPass!